There are the kind of kids who love to read and can’t get their hands on enough books to quench their appetite for the written word. They get lost in stories, get emotional about characters and topics, talk enthusiastically about their reading life with other readers, and go through books like a premenstrual woman goes through peanut M&M’s. How did this happen? How can two children have such completely different attitudes toward reading? We’d like you to check out two contrasting videos. Each baby is adorable and happy, and intensely involved in an interactive experience that will powerfully affect his/her development. Here’s the first one, and we’ll show the second in the next post. We have to admit, the first time we saw this commercial we were dismayed. 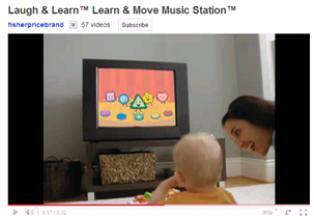 The Fisher Price Learn & Move Music Station is presented as an “interactive” learning game, but in our opinion it could actually teach a baby to become passive. All he has to do is push a button—no thinking on his part—and he can watch the TV entertain him. It reminds us of a rat getting a food pellet for pushing a lever. This innocent baby is so primed for learning and language, yet there he is, being propped in front of a screen, which he’ll probably spend more time interacting with than with other human beings. And his parents can leave him there in front of the TV; there’s no social interaction required. The game is a babysitting substitute, and is establishing a pattern in this family of putting children in front of a screen to keep them busy. It seems to us that this baby could easily acquire a taste for staring at a screen all day without knowing any different, like all those kids we see whose lives revolve around television, computers, and video games. They spend hours staring at screens—not interacting with other humans and developing the language and social skills that can make them avid readers and curious, confident students. Let us know what you think, and stay tuned for Part Two. And we look forward to hearing more from you, too! As an expectant mother, all this news is very interesting. Looking forward to hearing more from you.